Traveling by plane is by far the easiest way to travel between Siem Reap and Sihanoukville, and unsurprisingly, the most expensive. Cambodia Angkor Air offers flights four times weekly, with one-way tickets going for $115 to $150 and roundtrip tickets between $230 and $300. They’ve got a monopoly, so tickets aren’t cheap. However, if you’re pressed for time the cost of the flights may well be worth it to avoid traveling 10 to 14 hours by car or bus. If you’d like more details about Cambodia Angkor Air’s Sihanoukville to Siem Reap flight.Flight time is a little under one hour. Siem Reap to Sihanoukville: Tuesday, Thursday, Saturday, and Sunday at 1:00 p.m.
Sihanoukville to Siem Reap: Tuesday, Thursday, Saturday, and Sunday at 2:30 p.m.
There’s only one bus that goes direct from Siem Reap to Sihanoukville without stopping in Phnom Penh. It’s a Virak Buntham night bus, which of all of the tourist buses in Cambodia has one of the worst reputations for accidents due to driver error. They may promise that it will save time, but you couldn’t pay me to get onto one of these buses. There are several other bus companies covering this route that are only marginally better, including Sorya and GST. Personally, I wouldn’t do it. Capitol Tours also has a daily bus leaving Siem Reap at 6:30 a.m. for Phnom Penh (connecting in Phnom Penh with the 2:30 p.m. bus to Sihanoukville). In the other direction, you can leave Sihanoukville at 7:00 a.m., 7:30 a.m., 8:00 a.m. and 9:00 a.m. to Phnom Penh and connect to either their 2:30 p.m. or 5:30 p.m. bus to Siem Reap. Capitol Tours are marginally better than the other full-size bus options for this route. 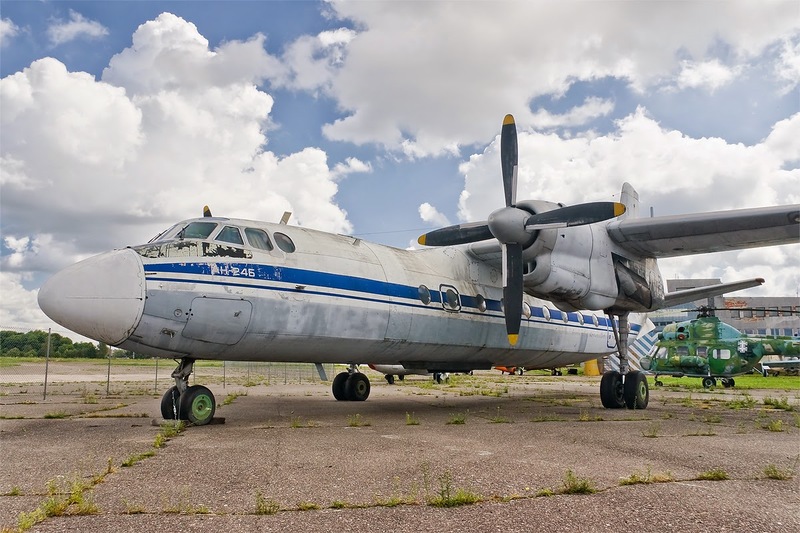 Tickets cannot be purchased online and must be purchased through a local travel agent or guesthouse a day before departure, however, Capitol will reliably respond to emails within 24 hours. Tickets cost $14 and they claim the journey takes about 12 hours. There are several mini-bus companies that go from Siem Reap to Sihanoukville and vice-versa, all with a 1-2 hour stop in Phnom Penh. 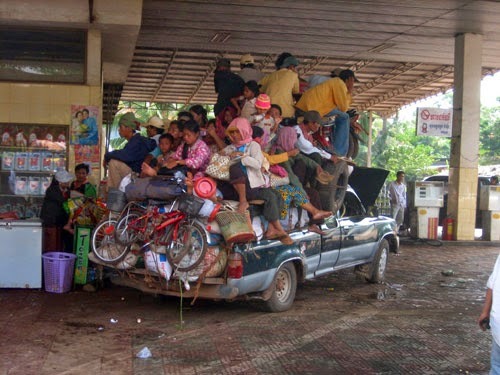 the total travel time including the stop in Phnom Penh, usually takes between 11 and 13 hours, although you will see these routes advertised as taking less time. Our favorite of these companies is Mey Hong. Mey Hong is a mini-bus company that is more locally-oriented (ie. it’s not particularly well-known amongst tourists). They drive comfortable Ford mini-buses that are air-conditioned with seat belts. During high season they have mini-buses to go the Siem Reap to Sihanoukville route that connect in Phnom Penh with a one hour break. Total travel time is about 11 hours–they drive fast! 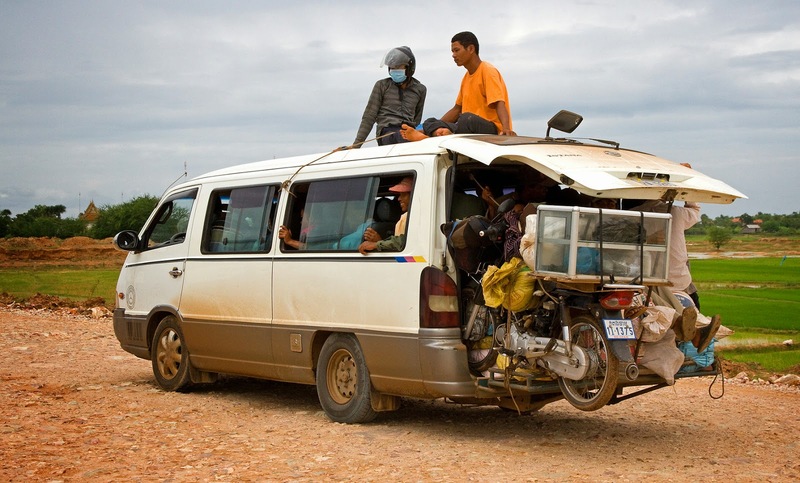 At the time of writing, they have a bus that leaves Sihanoukville at 7:30 a.m. and connects in Phnom Penh to their 1:30 p.m. bus to Siem Reap. In the other direction, they do not have any connecting buses (in high season they have a 3:00 p.m. bus which makes this route possible. Cost is $20 and tickets can be booked at any local travel agent or guesthouse. Taxis between Siem Reap and Sihanoukville cost between $120 and $150, and the trip will take about 10 hours, depending on the condition of the road between Phnom Penh and Siem Reap. Most private taxis are Toyota Camrys and can fit four passengers. For trips this length, though, four may be a tight squeeze depending on how much luggage you have. Most Camrys in Cambodia do not offer a lot of trunk space (it’s almost guaranteed to have packages for delivery in it). Private taxis can be hired through any travel agent or guesthouse, we’ve used Best Beach Travel in Sihanoukville (T: 015 678 924). Be sure to confirm the price before the trip as misunderstandings happen more often than we’d like. Mini-van taxis that seat up to 15 people are also available and offer more room for people and baggage. The cost is usually a bit more than double the cost of a regular taxi, at the time of writing we were quoted $250.